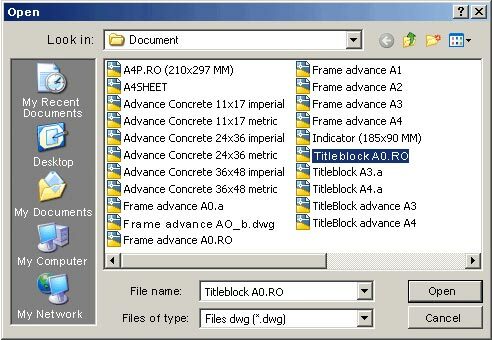 This folder contains some examples of layout frames and title blocks. User-defined title blocks and frames can be saved in any folder. 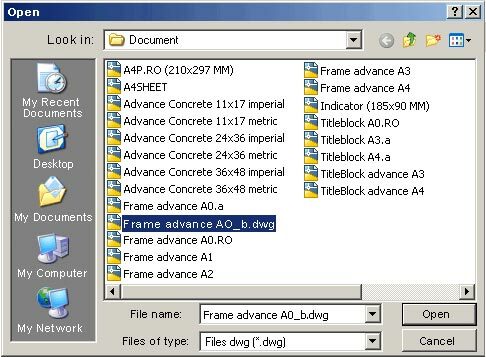 When creating a layout style in Advance Concrete, the program will first open the above folder for the selection of the layout elements. The layout properties dialog box appears. The different layout styles available in Advance Concrete that can be used for the layout creation are listed. 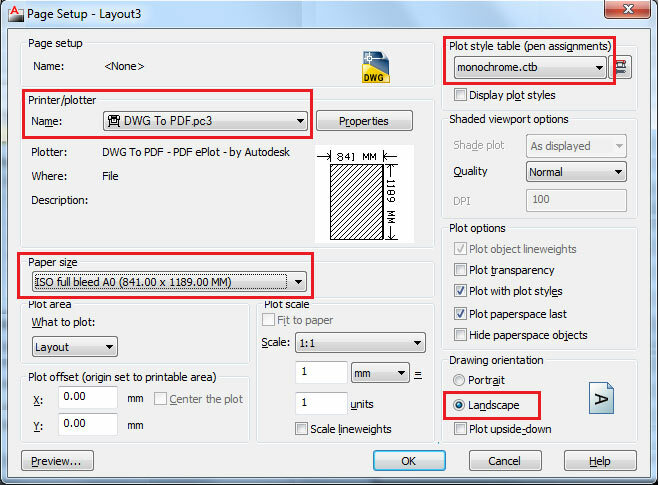 You can apply different templates, corresponding, for instance, to the paper format. 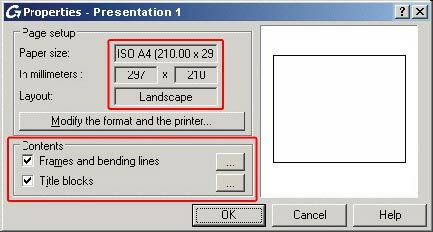 The following dialog box contains the settings for the newly created layout style, "Presentation 1". You can set the paper format, the title blocks and the frames. 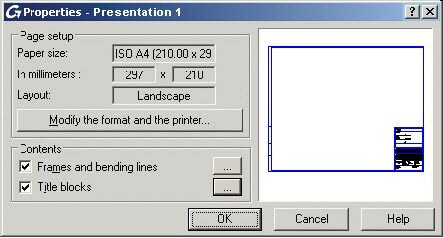 Click the "Modify the format and the printer..." button. 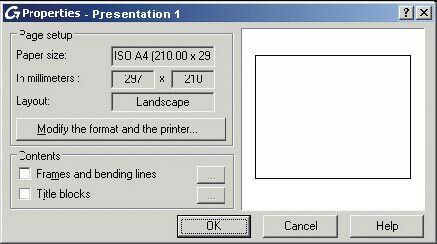 Set the appropriate printer and paper format. If necessary, you can select an additional plot style table. 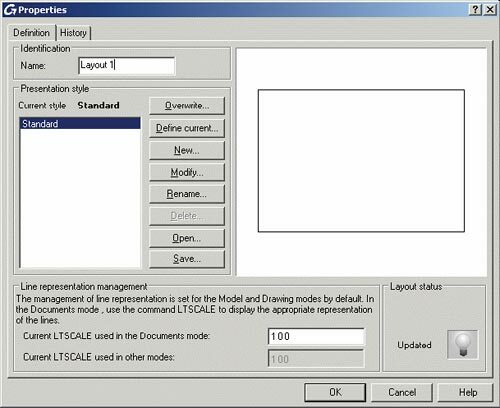 Make sure that the drawing orientation is set to "Landscape". Close the window by clicking "OK" and return to the previous window. 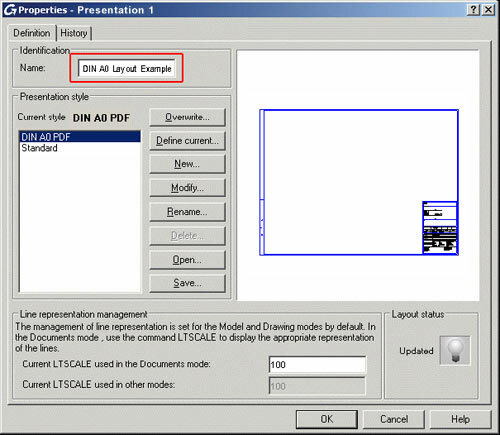 In the "Properties Presentation 1" dialog box you can see on the upper left side the modified printer and paper format. 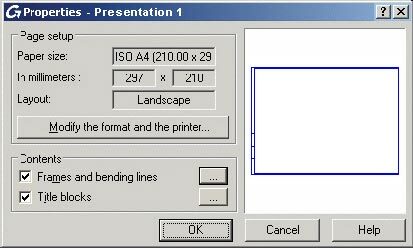 Select the "Frames and bending lines" and "Title blocks" options. The buttons on the right side of the options will be enabled. Click the button on the right side of the "Frames and bending lines" option. 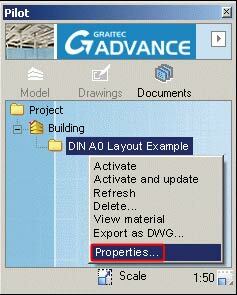 In the following dialog box click "Add..." and select the desired .dwg file. Load the file with "Open" and close the window with "OK". In the "Properties Presentation 1" dialog box the frames will be visible in the preview mode. Next, click the button on the right side of the "Title blocks" option. Click "Add..." and select the desired title block. Load the title block by clicking "Open" and close the dialog box with "OK". The result will be displayed in the preview window. Close the dialog box with "OK" and confirm the query with "Yes" so that all modifications made on the existing layouts (using this style) can be applied. Next, the newly created layout style will be set as the current style. Click "Define current...". The style should have a specific name. Click "Rename..." and enter the desired name. 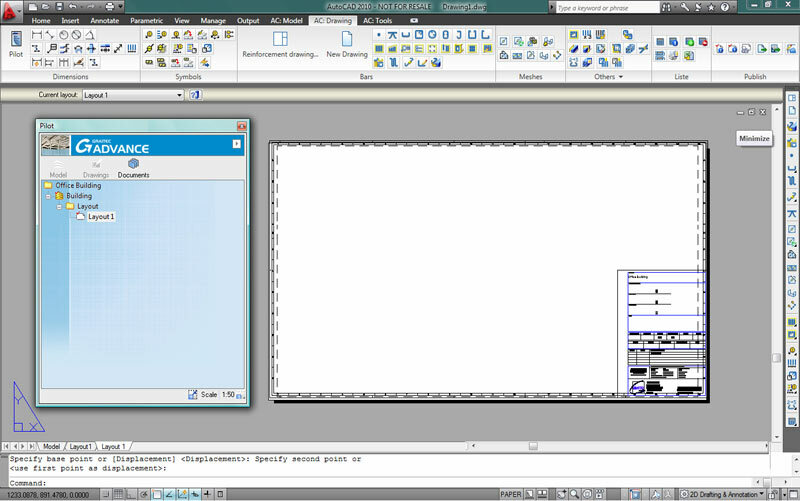 Finally, a new layout is created with the created template. Insert the layout name in the corresponding field and close the dialog box with "OK". 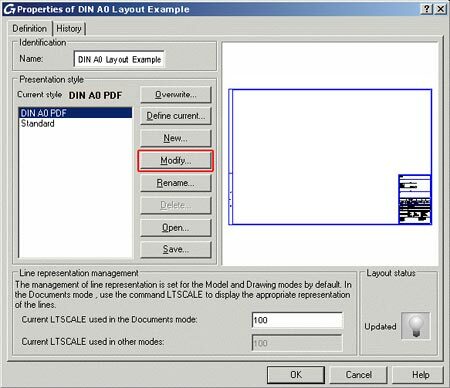 In the following window select the layout style and click "Modify...". Make the modifications like described for the layout creation. 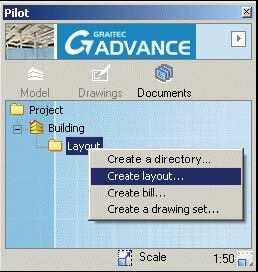 In the Pilot select "Documents", right-click on the "Layout" folder and select "Create layout..." from the context menu. 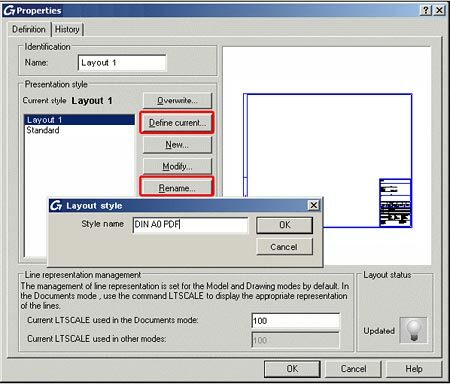 Insert a name for the layout, check the layout style and set, if necessary, another layout style as the current one. Confirm with "OK" and the new layout with frames and title block will appear in the Pilot and will be displayed on the monitor. By clicking "Save..." you can save a layout style in a file and transfer it on another computer. By clicking "Open..." you can read the exported layout style on the target computer.